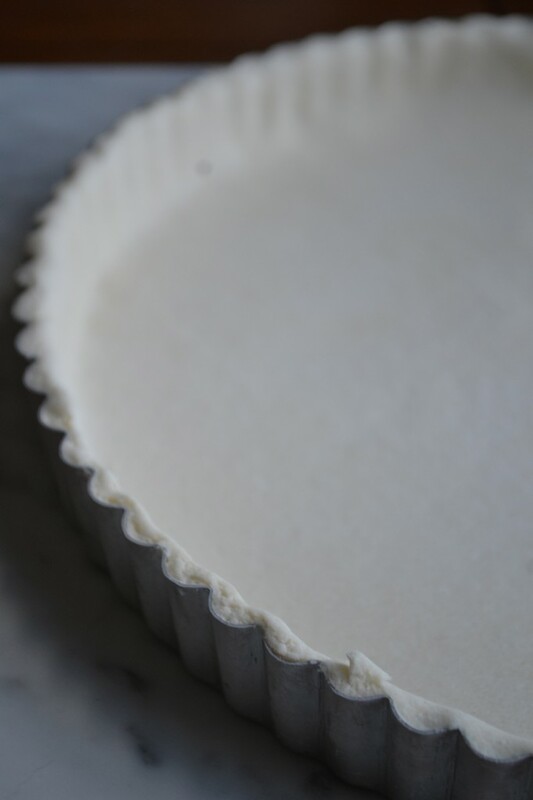 Please see my new post with tons of step by step photos and an updated recipe for the perfect gluten free pie crust! Scroll down on this page for examples of recipes where you can use either pie crust for perfect results every time. Today, I’m making gluten free pie crust. And I know you want to do it, too. Or at least you’d thought about it. C’mon. Everybody’s doin’ it. It’s holiday time! So, out of respec’ for the Pilgrims and stuff, watch the video. I will show you how easy it is to make gluten free pie crust, and how to roll it out and make a super smooth, gorgeous crust. 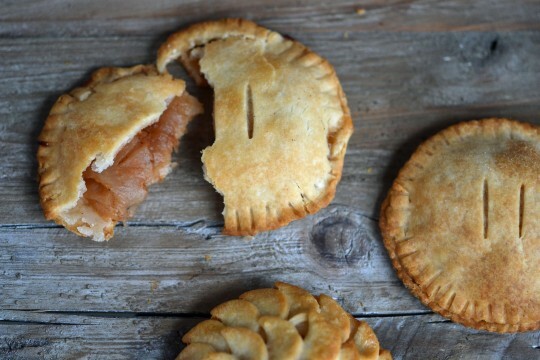 Miniature gluten free apple pies. 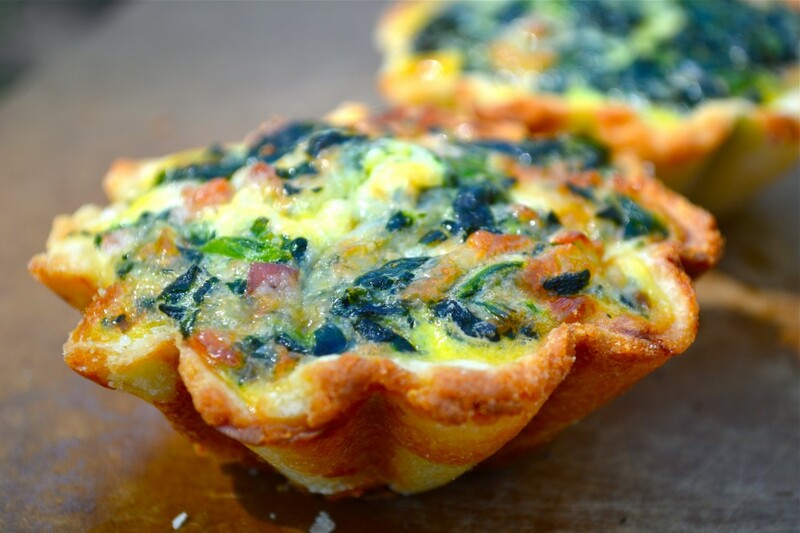 Who says real men don’t eat quiche? 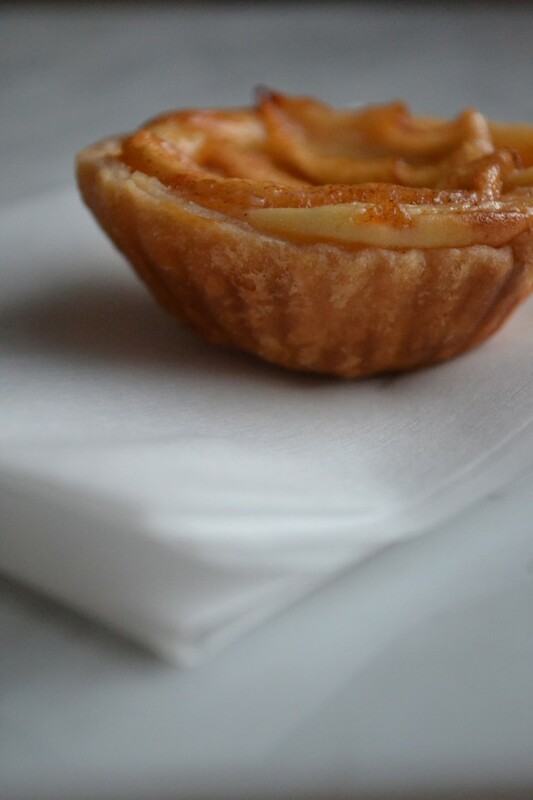 How about some Apple Tartlets with (or without) custard filling? Into the bowl of your food processor fitted with the steel blade (or a large bowl, if you don’t have a food processor), place the flour, xanthan gum, baking powder, salt, and confectioner’s sugar, and pulse a few times until well-combined (or whisk if not using the machine). Add the chopped and chilled butter, and pulse until the chunks of butter are a bit smaller and are covered in the dry mixture. P.S. If you haven’t yet, please pick up a copy of BOTH of My Cookbooks! I can’t keep the blog going without your support! So glad, Karen (well, except for the hard-as-a-rock time. Overbaking it will definitely do that. If you know the filling is going to take a while to bake, try making the crust a bit thicker – and don’t bake in a glass pie plate. The bottom bakes super fast in glass. I thought you did great. Very natural, easy to see. There was one time I wanted to say “Wait…go back…don’t edit that part out!” But alas, I don’t remember what it was. I loved watching it and now making pie crust doesn’t scare me so much. I’m also eagerly awaiting you do to a how-to on making tortillas! I SO love them and have been afraid to try them. Visual support would be great! :-) Keep ’em coming! Thanks for your video, Nicole! Never was one to make pie crusts and now that I have to do them gf, it seemed like an insurmountable task. 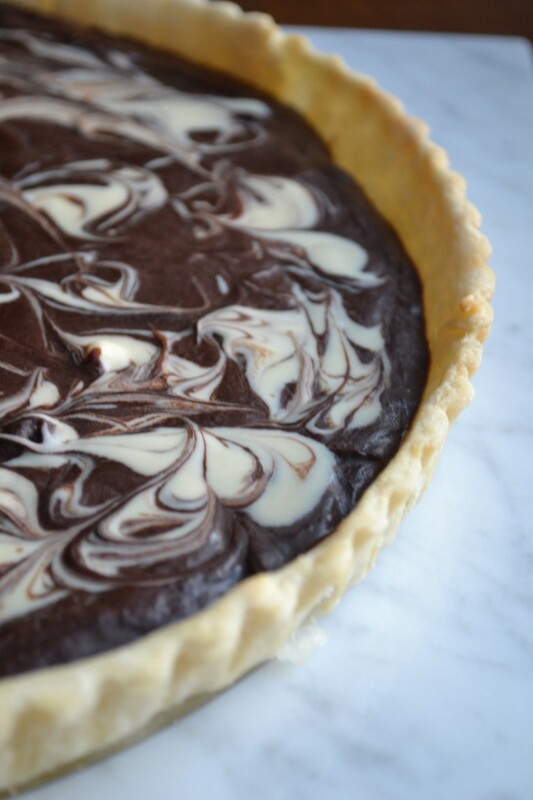 Just got my first box of Better Batter and will be making a choc cream pie with your crust for Thanksgiving…cross your fingers that my crust comes out as lovely as yours :) Thanks again! I can’t wait to get back to having more time to make more food again!! The baby has been sick and teething. Enough said. I haven’t even been able to keep up on reading the blog. I know, I’m going through withdrawals! Pie crust is a must for Turkey day. I have got to remember to get our turkey out of the freezer. Rats. Raised the birds all by ourselves and everything. :) You are doing an amazing job! Your book is on my Christmas list. I can’t wait! I hope the baby is feeling better soon. Have a happy thanksgiving! We raised them from chicks and butchered them in June. Next year I think we will wait to order them until later in the summer so it will be fresh for Thanksgiving. Happy Thanksgiving to you and yours! Nicole, this was actually REALLY helpful. I’ve not been a baker extraordinairre in the past, but going GF necessitates it to some degree, right? Watching you roll the dough between the plastic wrap and parchment paper is actually very helpful to those of us who are still novice. It gives me the courage to try some of the things I’ve passed over in the book so far because I didn’t feel ready yet. Thank you! So far so good, I have my dough chilling in the frig in two balls. Now, the question is, what is the oven temp and time needed to pre-bake the crust for a chocolate pudding pie? Is it the same as with a gluten crust? If it is in your cookbook (which I totally love, can’t wait for the next one) I missed it. Thanks for the Better Batter tip, I have now ordered twice. Love that flour! I have tried many with not so great results, this one is great! I’m GF for several months now, it is a challenge. Thanks for helping us all & for the how-to video. I can’t wait to see if my crust is a good one, never been a great crust maker before going GF. What fun! So glad you went for it! The baking time should be the same as with your conventional crust for your recipe. If you’re unsure, just watch it closely this first time around. So glad you’re enjoying Better Batter. It’s the best! You’re so welcome. I think you have a bright future ahead of you as a crust-maker. Ok, so I will have to try again, hopefully then I can report back success. :( I did everything according to the recipe/video, well I thought I did. The crust was tough……..hummm……so what do you think….over worked it, cooked too long………….? Darn I was so hopeful and excited……..I will try again another day. So sorry you were disappointed. My guess is that the butter was in pieces that were too small, so they sort of melted together. The flakiness of a good crust comes from separate pieces of cold butter being covered in – and separated by – flour. When the cold butter hits the heat of the oven, the butter expands and puffs out the dough surrounding it. When the butter is too small and mushed together, it just sort of melts together. No magic expanding butter leads to a tough crust. If you have to, err on the side of having butter in pieces that are a bit oversized, rather than having them so small that they meld together. And don’t mix the dough too much. If you’re using a food processor pulse in short bursts, and do too little rather than too much. Don’t worry. You’ll get there. Don’t lose hope! Yes, it does freeze very well. You can either freeze the round of dough (not rolled out — if you roll it flat and then freeze it, it will crack when you try to shape it), but you would do best to make, turn it into a pie, and freeze the whole stinkin’ (unbaked) pie. Then, take it out of the oven, defrost in the refrig, and then bake. You can even bake from frozen, if you need to. Just start out in an oven that isn’t very hot until it defrosts (about 10-15 mins), and then bring it to temperature and finish baking. Since you’re making pumpkin pie, assuming the filling is quite easy to make, I would suggest making the dough, rolling it out, and lining the pie plate with it (since you won’t need a top crust, you’ll only need half the pastry crust recipe, by the way), shaped and all. Then cover it tightly in something freezer-safe (I really like Press n Seal freezer paper), freeze, then either defrost in the refrig or fill as frozen, and do the lower oven temp thing to start baking. I see a Gluten-Free cooking show in your future…we sure need one!! Thanks for the video Nicole! For us visual learners it helps tremendously to watch someone else do the task we are attempting first! How about a video to accompany that puff pastry recipe, it could just be a short one, demonstrating the turns-we visual learners would be thankful! Sometimes lengthy written instructions hurt my brain:) I also like the “how to make tortillas” idea too. Thanks as always for all of the help and inspiration! BTW, I made your flat bread the other night – yummmm! It was a big hit! I’m so glad to know that the video is helpful. I know many people are, in fact, visual learners, and I bet that’s doubly true with gluten-free baking. A short video just showing the puff pastry ‘turns’ is a great idea, Sherry. Thanks! How-to make tortillas is also a great idea. I just made them last night! They can be made speedy-quick once you get the hang of it. They’re actually a great thing to make when I don’t have time for a lengthy prep for dinner. I have been thinking of using Betty Crocker’s Stir and Roll Pastry crust. It’s an old recipe, but it’s one I have often used: 1 1/3 C. flour (I’ll use the better batter), 1 tsp. salt, 1/3 cup canola oil, 3 tablespoons cold, whole milk (I have half and half in the house so I’ll use that. My husband hasn’t had apple pie since we found him to be gluten intolerant and I would like to make him an apple pie for Thanksgiving. I think this recipe will work for the crust, at least I hope so. I have been able to cook more the way I used to do since finding the Better Batter. Oil instead of butter? Hmmm… Better Batter should be able to stand in for your conventional flour, no problem, and you should be fine since you have made it before, so you know what the consistency should be. Don’t be afraid to tinker with the recipe (a little more milk, a little more or less flour, depending, etc.) to get it feeling and looking right. You can also just use my recipe the first go around, to make an apple pie. Whichever you prefer. Apple pie is a personal favorite of mine. Ever bake it in a paper bag in the oven? Heaven. Thanks so much for the video!! I’ve used several recipes from the book but somehow have been kinda scared of attempting the pie crust. Now, after your demo, I believe I’ll give it a shot! Also, I was wondering if you could share any hints on adapting your wonderful cheesecake recipe to a Pumpkin Cheesecake for the holidays? Ooooh pumpkin cheesecake, huh? That sounds delicious. I’ll put it on the list, maybe post a recipe! Thanks so much for responding so quickly! I’ll be checking in regularly for any Pumpkin Cheesecake updates…can’t wait! Have a lovely Turkey Day!!! How could I not know it’s you – I bet the other Peggys don’t have a quilting schedule! Love the blog! Love the book! Love the video! You make it all so easy. Thank you tons! I did have my birthday anniversary and it was peaceful and chocolate filled just the way I like it. I never thought about the butter being in small pieces, that makes sense now. I was just cutting it up in tablespoon size chunks and then mixing. I will try smaller pieces next time. Thanks. The video of the bobble head woman has been tossed. Ugh!!! So glad your birthday anniversary was peaceful and chocolate-filled. Sounds like heaven! You are not a dork! Thanks for the video. I think I over roll my dough because it always turns out tough, hard to cut through and not flakey. Don’t worry about the “okays” and “ums”; when I had to speak in front of people I would bob my head up and down, like a human bobble head. You were great. Did you already have your birthday anniversary? If you did, I hope it was happy. If your dough is tough and not flaky, most likely the butter isn’t in pieces. What makes dough flaky is bits of cold fat, separated by flour, hitting the hot oven, expanding in the heat, and puffing out the flour around them. So you need butter surrounded by flour, and layered upon itself. Does that make sense? I checked your book out from my local library and have made a few recipes. Just wanted to let you know that my husband and I absolutely LOVED the tortilla soup recipes. SO good. I’m so glad that you were able to get the book from the library – and that you have been enjoying it! Photocopy a few recipes before you have to return it. May I suggest the White Sandwich Bread on page 104, and the Brioche Bread on page 108. ;) Thank you for going out of your way to let me know that you’re enjoying it. It means a lot. OMG YOU ARE AMAZING!!!! I’m buying your book NOW!!!! Thank you for sharing! I’ve never been able to make a pie crust that pretty. I am in awe. I figure the book is filled with even more fantastic tricks. And I love the blog, so blog + video = book + me finally cooking yummy GF stuff!! Gee, thanks. :) It’s easy to make a pie crust like that. All you need is the right flour. Easy peasy. Fabulous! Your timing couldn’t be more perfect! Second – wow, you make that look so easy – I can’t wait to make a crusty sumpin sumpin! So great to see “you” in all your adorable kitchen greatness! Tortillas next??? I’m struggling with getting them to behave…. By the way, how do you like my roll of paper towels in the corner? Nice touch. I know. Do you practice? in front of a mirror? Just imagine us all in our bathrobes coffee clotching – no pressure. If your crust tends to fall apart, by the way, try rolling it a bit thicker. Sometimes that helps it to be more robust, less fragile. I’ll try making my piecrust a little thicker. Maybe I just need a new rolling pin…that’s it….